The Impala Queries page displays information about Impala queries that are running and have run in your cluster. You can filter the queries by time period and by specifying simple filtering expressions. Note: The Impala query monitoring feature requires Impala 1.0.1 and higher. Select Clusters > Cluster name > Impala service name Queries. On the Home > Status tab, select Impala service name and click the Queries tab. The Impala queries run during the selected time range display in the Results Tab. Filter the displayed queries Create filter expressions manually, select preconfigured filters, or use the Workload Summary section to build a query interactively. See Filtering Queries. Select additional attributes for display. Click Select Attributes. Selected attributes also display as available filters in the Workload Summary section. To display information about attributes, hover over a field label. See Filter Attributes. Display charts based on the filter expression and selected attributes. Cick the Charts tab. View charts that help identify whether Impala best practices are being followed. Click the Best Practices link. You can configure the visibility of the Impala query results and the size of the storage allocated to Impala query results. For information on how to configure whether admin and non-admin users can view all queries, only that user's queries, or no queries, see Configuring Query Visibility. Query information is stored in-memory in a ring buffer. If you restart Service Monitor, all queries are lost, and older queries eventually are dropped. For information on how to configure the query store, see Configuring Impala Query Data Store Maximum Size. To open the Impala Best Practices page, click the Best Practices tab on the Impala service page. The page contains charts that include description of each best practice and how to determine if it is being followed. See the Impala documentation for more detail on each best practice and for additional best practices. Adjust the time range to see data on queries run at different times. Click the charts to get more detail on individual queries. Use the filter box at the top right of the Best Practices page to adjust which data is shown on the page. For example, to see just the queries that took more than ten seconds, make the filter query_duration > 10s. Create a trigger based on any best practice by choosing Create Trigger from the individual chart drop-down menu. If an error occurred while processing the query, displays under the complete timestamp. Query Details – Opens a details page for the job. See query details. User's Impala Queries – Displays a list of queries run by the user for the current job. Cancel (running queries only) – Cancel a running query (administrators only). Canceling a running query creates an audit event. When you cancel a query, replaces the progress bar. Queries in the same YARN pool – Displays queries that use the same resource pool. You filter queries by selecting a time range and specifying a filter expression in the search box. Optionally, click Select Attributes to display a dialog box where you can chose which attributes to display in the Workload Summary section. Select the checkbox next to one or more attributes, and click Close. Click in the text box and press Enter or click Search. The list displays the results that match the specified filter. The Workload Summary section refreshes to show only the values for the selected filter. The filter is added to the Recently Run list. The following table includes available filter attributes and their names in Cloudera Manager, types, and descriptions. Note: Only attributes for which the Supports Filtering? column value is TRUE appear in the Workload Summary section. STRING TRUE The result of admission, whether immediately, queued, rejected, or timed out. Called 'admission_result' in searches. MILLISECONDS TRUE The time from submission for admission to completion of admission. Called 'admission_wait' in searches. BYTES TRUE The highest amount of memory allocated by this query at a particular time across all nodes. Called 'memory_aggregate_peak' in searches. BYTES TRUE The total number of bytes sent between Impala Daemons while processing this query. Called 'bytes_streamed' in searches. MILLISECONDS TRUE The total amount of time the query spent waiting for the client to fetch row data. Called 'client_fetch_wait_time' in searches. NUMBER TRUE The total amount of time the query spent waiting for the client to fetch row data divided by the query duration. Called 'client_fetch_wait_time_percentage' in searches. STRING TRUE The user who created the Impala session that issued this query. This is distinct from 'user' only if delegation is in use. Called 'connected_user' in searches. STRING TRUE The host coordinating this query. Called 'coordinator_host_id' in searches. STRING TRUE The database on which the query was run. Called 'database' in searches. STRING TRUE The type of DDL query. Called 'ddl_type' in searches. STRING TRUE The effective user for the query. This is set only if delegation is in use. Called 'delegated_user' in searches. MILLISECONDS TRUE The duration of the query in milliseconds. Called 'query_duration' in searches. 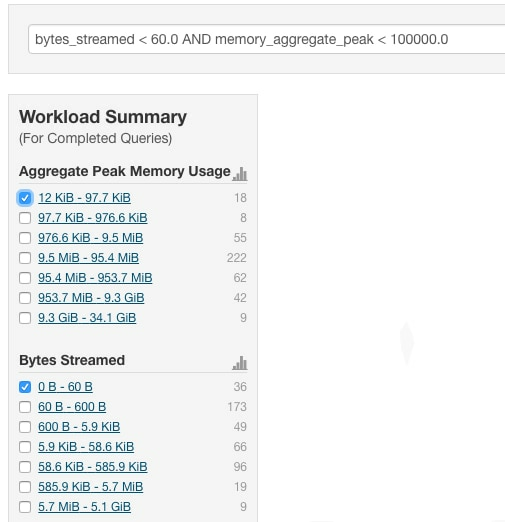 BYTES TRUE The planning process's estimate of per-node peak memory usage for the query. Called 'estimated_per_node_peak_memory' in searches. BOOLEAN FALSE Whether the query is currently executing. Called 'executing' in searches. STRING FALSE An alphabetically sorted list of all the file formats used in the query. Called 'file_formats' in searches. BYTES TRUE The total number of bytes read from HBase by this query. Called 'hbase_bytes_read' in searches. BYTES_PER_SECOND TRUE The average HBase scanner read throughput for this query. This is computed by dividing the total bytes read from HBase by the total time spent reading by all HBase scanners. Called 'hbase_scanner_average_bytes_read_per_second' in searches. BYTES TRUE The average HDFS scan range size for this query. HDFS scan nodes that contained only a single scan range are not included in this computation. Low numbers for a query might indicate reading many small files which negatively impacts performance. Called 'hdfs_average_scan_range' in searches. BYTES TRUE The total number of bytes read from HDFS by this query. Called 'hdfs_bytes_read' in searches. BYTES TRUE The total number of bytes read from HDFS that were read from the HDFS cache. This is only for completed queries. Called 'hdfs_bytes_read_from_cache' in searches. NUMBER TRUE The percentage of all bytes read by this query that were read from the HDFS cache. This is only for completed queries. Called 'hdfs_bytes_read_from_cache_percentage' in searches. BYTES TRUE The total number of bytes that had to be skipped by this query while reading from HDFS. Any number above zero may indicate a problem. Called 'hdfs_bytes_skipped' in searches. BYTES TRUE The total number of bytes written to HDFS by this query. Called 'hdfs_bytes_written' in searches. BYTES TRUE The total number of local bytes read from HDFS by this query. This is only for completed queries. Called 'hdfs_bytes_read_local' in searches. NUMBER TRUE The percentage of all bytes read from HDFS by this query that were local. This is only for completed queries. Called 'hdfs_bytes_read_local_percentage' in searches. BYTES TRUE The total number of remote bytes read from HDFS by this query. This is only for completed queries. Called 'hdfs_bytes_read_remote' in searches. NUMBER TRUE The percentage of all bytes read from HDFS by this query that were remote. This is only for completed queries. Called 'hdfs_bytes_read_remote_percentage' in searches. BYTES_PER_SECOND TRUE The average HDFS scanner read throughput for this query. This is computed by dividing the total bytes read from HDFS by the total time spent reading by all HDFS scanners. Called 'hdfs_scanner_average_bytes_read_per_second' in searches. BYTES TRUE The total number of bytes read from HDFS by this query that used short-circuit reads. This is only for completed queries. Called 'hdfs_bytes_read_short_circuit' in searches. NUMBER TRUE The percentage of all bytes read from HDFS by this query that used short-circuit reads. This is only for completed queries. Called 'hdfs_bytes_read_short_circuit_percentage' in searches. STRING TRUE The version of the Impala Daemon coordinating this query. Called 'impala_version' in searches. BYTE_SECONDS TRUE The total accrued memory usage by the query. This is computed by multiplying the average aggregate memory usage of the query by the query's duration. Called 'memory_accrual' in searches. BYTES TRUE Amount of memory spilled to disk. Called 'memory_spilled' in searches. STRING TRUE The network address that issued this query. Called 'network_address' in searches. STRING TRUE The node with the highest peak memory usage for this query. See Per Node Peak Memory Usage for the actual peak value. Called 'memory_per_node_peak_node' in searches. BOOLEAN TRUE Whether the query ran out of memory. Called 'oom' in searches. BYTES TRUE The highest amount of memory allocated by any single node that participated in this query. See Node with Peak Memory Usage for the name of the peak node. Called 'memory_per_node_peak' in searches. MILLISECONDS TRUE The total amount of time the query spent waiting for planning to complete. Called 'planning_wait_time' in searches. NUMBER TRUE The total amount of time the query spent waiting for planning to complete divided by the query duration. Called 'planning_wait_time_percentage' in searches. STRING TRUE The name of the resource pool in which this query executed. Called 'pool' in searches. If YARN is in use, this corresponds to a YARN pool. Within YARN, a pool is referred to as a queue. STRING FALSE The id of this query. Called 'query_id' in searches. STRING TRUE The current state of the query (running, finished, and so on). Called 'query_state' in searches. STRING TRUE The status of the query. If the query hasn't failed the status will be 'OK', otherwise it will provide more information on the cause of the failure. Called 'query_status' in searches. STRING TRUE The type of the query's SQL statement (DML, DDL, Query). Called 'query_type' in searches. MILLISECONDS TRUE The total amount of time the query spent waiting for pool resources to become available . Called 'resources_reserved_wait_time' in searches. NUMBER TRUE The total amount of time the query spent waiting for pool resources to become available divided by the query duration. Called 'resources_reserved_wait_time_percentage' in searches. NUMBER TRUE The number of rows inserted by the query. Called 'rows_inserted' in searches. NUMBER TRUE The number of rows produced by the query. Called 'rows_produced' in searches. STRING FALSE The name of the Impala service. Called 'service_name' in searches. STRING TRUE The ID of the session that issued this query. Called 'session_id' in searches. STRING TRUE The type of the session that issued this query. Called 'session_type' in searches. STRING FALSE The query's SQL statement. Called 'statement' in searches. BOOLEAN TRUE Whether the query was flagged with missing table or column statistics warning during the planning process. Called 'stats_missing' in searches. MILLISECONDS TRUE The sum of the CPU time used by all threads of the query. Called 'thread_cpu_time' in searches. NUMBER TRUE The sum of the CPU time used by all threads of the query divided by the total thread time. Called 'thread_cpu_time_percentage' in searches. MILLISECONDS TRUE The sum of the time spent waiting to receive data over the network by all threads of the query. A query will almost always have some threads waiting to receive data from other nodes in the query's execution tree. Unlike other wait times, network receive wait time does not usually indicate an opportunity for improving a query's performance. Called 'thread_network_receive_wait_time' in searches. NUMBER TRUE The sum of the time spent waiting to receive data over the network by all threads of the query divided by the total thread time. A query will almost always have some threads waiting to receive data from other nodes in the query's execution tree. Unlike other wait times, network receive wait time does not usually indicate an opportunity for improving a query's performance. Called 'thread_network_receive_wait_time_percentage' in searches. MILLISECONDS TRUE The sum of the time spent waiting to send data over the network by all threads of the query. Called 'thread_network_send_wait_time' in searches. NUMBER TRUE The sum of the time spent waiting to send data over the network by all threads of the query divided by the total thread time. Called 'thread_network_send_wait_time_percentage' in searches. MILLISECONDS TRUE The sum of the time spent waiting for storage by all threads of the query. Called 'thread_storage_wait_time' in searches. NUMBER TRUE The sum of the time spent waiting for storage by all threads of the query divided by the total thread time. Called 'thread_storage_wait_time_percentage' in searches. MILLISECONDS TRUE The sum of thread CPU, storage wait and network wait times used by all threads of the query. Called 'thread_total_time' in searches. STRING TRUE The effective user for the query. This is the delegated user if delegation is in use. Otherwise, this is the connected user. Called 'user' in searches.